Spanish artists Compania D Click teach circus skills! About the company: Compania D Click was formed in 2010 by 3 people who have the same idea about the meaning of circus. They think circus is a mix of scenic arts where everything is possible, they can use the most typical circus technics like acrobactics, mixed with dance and theater; all to tell a story. Hugo Gauthier – Circus artist from Belgium, studied in the Circus School of Brussels and specialises in Chinese pole in the Circus of the World in Chile. Javier Garcia – Circus artist from Spain, learned his skills at the Madrid Circus School, Carampa. His specialities are juggling and magic. Ana Castrillo – Comes from theater-dance world. Ana is a lifelong dancer, and joined the company because she was attracted by the circus world to give the movement to the scene and balance to the team. 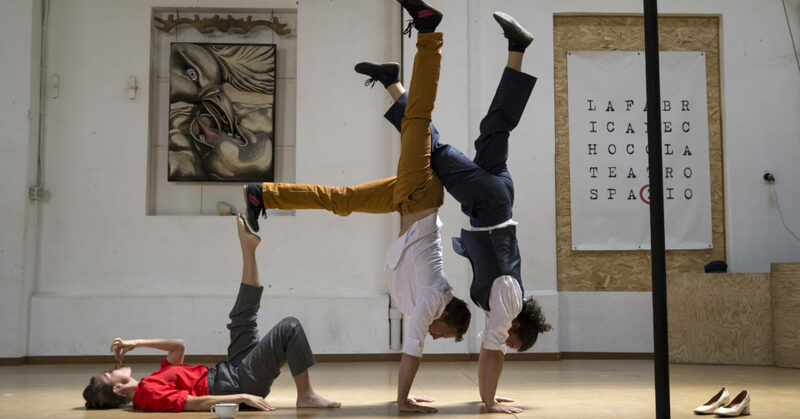 All of them combine their artistic passion for performing with teaching at the Social Circus School of Zaragoza, Spain. Performing their brilliant show, Isla, twice in Cornwall this April, make sure you book tickets to see them at Callington Primary School on the 7th and in the Big Top at Chyan Farm on the 10th. Description: This class is used to inspire an appreciation for the circus arts in a supportive, non-competitive environment. They help build an individual’s physical and mental wellness and with the group together. In this kind of workshop the pupils gain strength, flexibility and achieve more consciousness their bodies. 1. Warm up: Through plays, we will activate our body for the movement and the physical work to grow flexibility and trust. 2. Circus technique. We are going to teach different techniques, adapting the kind of work to the group. We will do theater, movement, acro-balance, acrobatics and juggling. It may be possible to include balancing on objects, trapeze and aerial silk. Ages and duration: 6 to 12 years old, 2 hours | 13 to 18 years old, 3 hours. Number of pupils: Maximum 16.